GN Hydrocyclone desander desilter for drilling mud solids control,10 inch desander cones,4 inch desilter cones are popular used in drilling fluids system for oil gas drilling,and HDD(Horizontal directional drilling).GN also manufacture shale shakers,centrifuges,complete equipments for mud tank system-GN Desander Desilter. Dropby E2168 in CIPPE 2019 in 27~27 Mar. For being quite a long time, the HDD mud recyling is just screening, or add some cyclones; though it is common sense for everyone sometimes that corroct sized combination of equipment can ideally targets drilled solid of different particle sizes from large drilled solids through to sand silt, clay and colloids; the decanter centrifuge cost money. While it get rid of 5~10 micron solids. Decanter centrifuge have been approved for oil gas and lots of big HDD projects, that it works, save downhole tools life, and reduce the disposal costs. Then the topic comes to after the desilter cyclones, is it still worth to have a decanter centrifuge. Real conflict thing is until you use a decanter centrifuge, you can find out the real value in it. 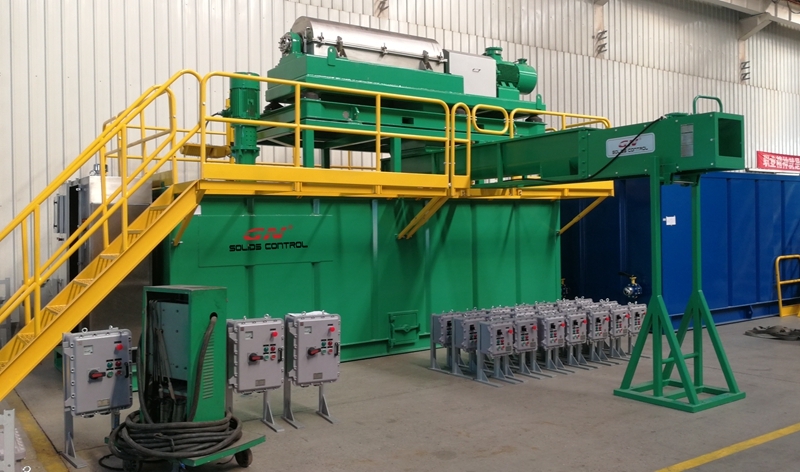 Very recently GN have delivered a mud recycling system to Sinopec projects, with a decanter centrifuge. Decanter centrifuge GNLW363C-VFD is last stage separation equipment for fine solids separation. After several time recycling, there will be much fine solids in the drilling mud. The centrifuge is used to remove the fine solids to ensure the property of the drilling mud. Decanter centrifuge is fixed on a collecting tank with 4 supporting legs. Liquid is flow into the tank and solids will be collected by the screw conveyor and transferred out of the system. If you would like to know more info about the decanter centrifuge for HDD projects, pls let us know.